The dachshund is a short-legged, elongated dog breed belonging to the hound family. The standard size dachshund was bred to scent, chase, and flush out badgers and other burrow-dwelling animals, while the miniature dachshund was developed to hunt smaller prey such as rabbits. In the American West they have also been used to hunt prairie dogs. The name "dachshund" is of German origin and literally means "badger dog", from Dachs ("badger") and Hund ("dog"). The pronunciation varies widely in English: variations of the first syllable include /ˈdɑːks/, /ˈdæks/, /ˈdæʃ/, and of the second syllable /hʊnt/, /hʊnd/, /ənd/. In German it is pronounced [ˈdakshʊnt]. 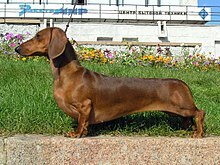 Because of their long, narrow build, they are often nicknamed hot dog, wiener dog or sausage dog. Although "dachshund" is a German word, in modern German they are also commonly known by the name Dackel; in the case of the formally certified hunting and tracking rank, the name Teckel is used. While classified in the hound group or scent hound group in the United States and Great Britain, there are some who consider this classification to be arguable, speculating that it arose from the fact that the word Hund is similar to the English word hound – and the word "Dachshund" has even been anglicized as "Dash Hound". Many dachshunds, especially the wire-haired subtype, may exhibit behavior and appearance that are similar to that of the terrier group of dogs. An argument can be made for the scent (or hound) group classification because the breed was developed to use scent to trail and hunt animals, and probably descended from scent hounds, such as bloodhounds, pointers, Basset Hounds, or even Bruno Jura Hounds; but with the dogged and persistent personality and love for digging that probably developed from the terrier, it can also be argued that they could belong in the terrier, or "earth dog", group. In the Fédération Cynologique Internationale (World Canine Federation), or FCI, the dachshund is actually in its own group, Group 4, which is the dachshund group. Part of the controversy is because the dachshund is the only certifiable breed of dog to hunt both above and below ground. The typical dachshund is long-bodied and muscular, with short and stubby legs. Its paws are unusually large and paddle-shaped, for efficient digging. It has skin that is loose enough not to tear while tunneling in tight burrows to chase prey. The dachshund has a deep chest to allow enough lung capacity to keep going when hunting. Its snout is long with an increased nose area that absorbs odors. There are three types, classified by their coats: short-haired, called "smooth"; long-haired; and wire-haired.